The Central government has decided to raise an all-women Indian Reserve Battalion in Jammu and Kashmir to deal with schoolgirls throwing stones at security forces. At this rate, might a juvenile police force have to be raised to deal with underage stone-throwers? Creating a special police force to deal with women is the typical response of a government that is happy addressing the symptoms rather than the cause of the unrest in the state. The situation in Kashmir today is a mess. The police, the administration and the political leadership is cut off from the villages and the countryside. The Director General of Police (DGP) has advised policemen not to stay in their homes in villages for fear of the militants. About 40 homes of policemen have been torched by militants but it is not clear where the DGP expects his policemen to go as the state government has no provision to house the thousands of policemen on its rolls. The situation in the Kashmir is unlikely to improve in the coming weeks and months. Those who advocate using a strong hand to deal with counter-insurgencies cite the success of such strategies the world over – most recently, as one such person pointed out, in Chechnya. When J&K Chief Minister Mehbooba Mufti came to Delhi seeking the promise of a dialogue, she was apparently told in no uncertain terms that there will be no dialogue with the All Party Hurriyat Conference. She was given sanction however to increase the strength of the state police force by 5,000 – this includes the proposed women’s battalion. As far as starting a dialogue with the Hurriyat is concerned, the Central government has said in the Supreme Court on Friday that there is no question of speaking with them. Attorney General Mukul Rohatgi told the apex court that any dialogue will only be with legally recognised stakeholders. From the government’s perspective, talking to Hurriyat is going to lead nowhere. The Hurriyat leaders are not in a position to prevent people from throwing stones at the security forces or protesting on the streets of Srinagar. They have no constituency among the young. Secondly, they are also in no position to influence Pakistan or the militant-groups based in Pakistan to turn off the tap on terrorism. They bring nothing to the table except a separatist and Islamist agenda for Kashmir. However, none of the recognised parliamentary political parties of Jammu and Kashmir, “the legal stakeholders”, will bring anything more substantial to the dialogue table than their own narrow self-interest. In fact, it can be argued that they are squarely responsible for the lack of governance in the state that has brought it to a situation similar to that prevailing in 1989. Had the National Conference and the Congress party not rigged the state assembly election of 1987, most of the current leaders of the Hurriyat, then in the Muslim United Front, would have been in a coalition government with the BJP. And who knows, one of them might have been appointed the chief minister of Jammu and Kashmir instead of Farooq Abdullah. Politicians belonging to the established parliamentary parties cannot even go freely to their constituencies to talk to the people let alone bring the situation in Kashmir to normalcy. Like the Hurriyat leaders they have no control over the protestors or the organ-grinders in Pakistan to whose tune the militants respond. They are further disadvantaged by their lust for power which requires preservation of the status quo. After the massive victory in the Uttar Pradesh elections, some political observers had hoped that a confident Indian Prime Minister would make an overture to Islamabad. However, any potential of dialogue with Pakistan has now become complicated by the award of death penalty by a Pakistani army court to Kulbhushan Jadhav, alleged to be an Indian spy. Allegations that Indian intelligence agencies have kidnapped a retired Lt. Col. of Pakistan from Lumbini in Nepal has made any possible thaw in the relationship even less likely. Therefore the possibility of an India-Pakistan dialogue making a positive impact on the Kashmir situation is ruled out for the time being. If governance had been good and the state government seen as fair, transparent and honest, perhaps the local citizenry would not have been so completely alienated from it. Ambient anger about the long-unsettled political issue of Kashmir may have been somewhat subdued. But the alliance government of the Peoples’ Democratic Party and the BJP has not been able to provide good governance. Above all, there seems to be no clarity in Delhi about what to do about the situation in the Kashmir Valley. For example, Ram Madhav – the BJP general secretary in-charge of nurturing the party’s coalition government in Srinagar – defended the the army using an innocent civilian as human-shield against stone throwers, saying that everything was fair in love and war! Another BJP leader went on national television to demand that stone-throwers should be prosecuted as terrorists. 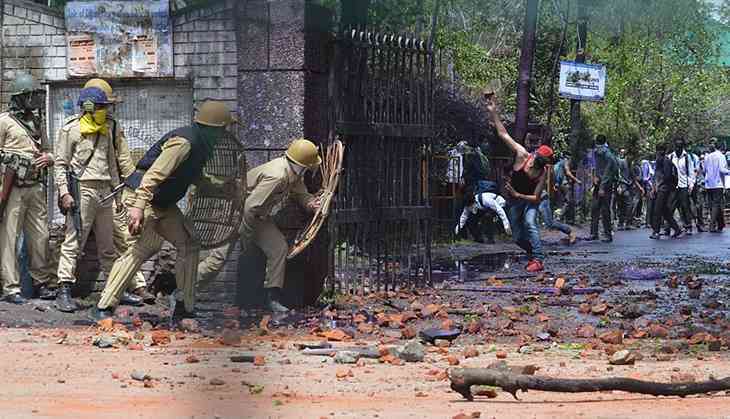 As if this were not enough, the Indian Army Chief General Bipin Rawat described those who throw stones and disrupt army operations as “over ground workers of terrorists”. Prime Minister Narendra Modi remains so caught up as usual with alliteration that in his public speeches he thought it fit to ask the Kashmiris to choose between “tourism and terrorism”! It is not at all clear who is in charge of the Modi government’s Kashmir policy. And this despite the fact that in National Security Advisor Ajit Doval, the government has an experienced and old Kashmir hand who has displayed political imagination in dealing with other insurgencies – especially the Naga one. Perhaps it is the BJP hotheads who rule the roost when it comes to deciding the government’s Kashmir policy or the NSA finds no time in his busy schedule to deal with Kashmir. It could well be that the NSA recognises the divergence between national interest and the BJP's interest when it comes to Kashmir. As of now, however, it seems that all potential avenues for addressing either the immediate or the long-term issues of the Kashmiri people are blocked. There is no mechanism in place to answer their pending questions. Mehbooba Mufti had perhaps hoped that she could go back from Delhi with the promise of a dialogue and douse local anger to some extent. It would have helped her gain limited legitimacy with the people of the state, creating an impression that she was acting as their advocate with the Union government. That on her return the first thing she did was to hold the meeting of the Unified Command Headquarters sends a signal that she now intends to deal with the situation as a law and order issue. The options before Mehbooba Mufti are also limited. She made a mistake by forming the government with the BJP after her father’s death without extracting any political concessions. At that time she perhaps thought the BJP would split her party leaving her high and dry. Now she has even less leverage with her alliance partner. She has little option than to continue with the crackdown on the protestors while simultaneously increasing her Kashmir-centric pitch. Ultimately, a stage will come when she will have to ditch the alliance with the Bharatiya Janata Party (BJP). Already the vulnerabilities of PDP leaders are very high – a district level PDP leader was shot dead by militants only a week ago. She herself is at risk and therefore in no position to visit her constituents or the homes of those who have been killed, maimed or blinded by the security forces. If the Chief Minister is unable to control the situation on the ground – and as of now there is no indication that she is capable of doing that – then even the BJP might jettison her. She can be removed either by splitting her party or by imposing President’s rule. Nothing is ruled out in the deteriorating dynamic of the Kashmir situation. PM मोदी को अक्षय कुमार ने अपना गुस्सा निकालने के सिखाए गुर, बोले- समुद्र के किनारे जाकर..